No stairs in the exclusive Parkwood Knoll complex so close to Uptown CLT & Freedom Park. 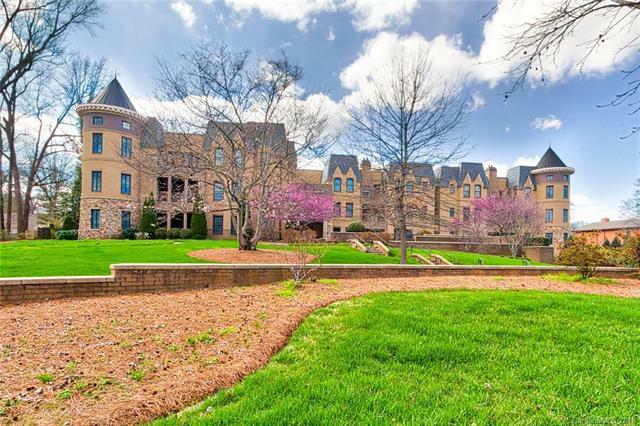 Very private, penthouse unit with gated garage and 2 assigned parking spaces. One level living from garage to condo. High-end finishes abound with 10ft ceilings, 8ft doors, heavy moldings & built-ins. Master BD is full of natural light and leads to luxurious master bath. Garden tub, tiled shower, dual vanities, & WIC with storage system. Second BD has its own private bathroom. Kitchen overlooks living room and has tons of counter space and a gas cooktop for all the cooks out there. Living room has a gas log fireplace and built-in bookcases. There is a flex room off the LR that would be a great office/study. Dining area leads to the patio w/in-ground gas grill, hose bib & power outlet. Unit located on backside of building away from Park Road. Storage unit in garage. Walk to Freedom Park & Park Road Shopping Center.